Canadian handset maker Research is Motion isn’t out of danger just yet but as we get closer to the promised launch of the company’s next generation operating system, there are at least a few rays of light that indicate good fortune is just over the horizon. 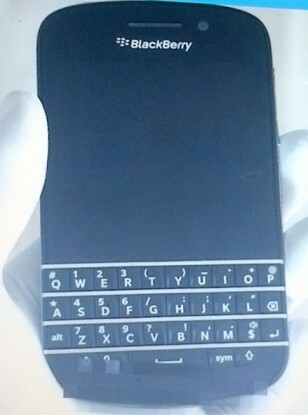 The latest bit of hope recently arrived in the form of a single photo showing what is believed to be the full-QWERTY N-Series handset, otherwise known as the BlackBerry X10. The image, brought to our attention by fan site CrackBerry, reveals that the keyboard is no longer curved like we have seen on many other BlackBerry handsets. Instead, it’s been straightened out like the one on the Bold 9900. This change isn’t settling so well with some RIM faithful, however, judging from some comments on the site. Some people are even hoping that the image is a fake and that the real X10 will carry on the curved tradition. Additionally, the phone appears to have a taller touchscreen than other handsets we have seen with touch and QWERTY boards. It’s one of two new devices that most believe we will see unveiled next month at the official BlackBerry 10 event. Photos of the other BlackBerry device, a model that relies solely on its touchscreen interface, have also surfaced recently. This other phone is collectively known as the BlackBerry Z10. Both phones will of course ship with the latest BlackBerry 10 mobile operating system sometime in 2013.